Two Bears Farm and the Three Cubs: Happy 5th Birthday! On Saturday, we invited family over. We smoked a couple of our chickens and had a feast, followed by Bob the Builder cake. Pierce wanted Diego and Baby Jaguar cake, but he's had every version of Diego cake out there, so we went with something different. Sadly, after I got the bill for this cake it looks like I'll now be making our birthday cakes in future years. I just can't see shelling out $25 for a cake again - even if it was very tasty (plus, they spelled Pierce's name wrong!). A stomach bug has been going around Pierce's class at school, so we decided to let him blow out the candle on his individual piece of cake, just in case we were incubating something. Then Pierce had a few presents to open. 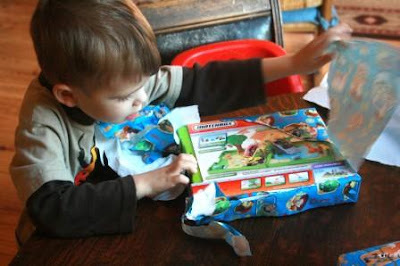 Many thanks to Cat Cat and Pop Pop, Uncle John, and Pam and George who all had gifts for Pierce. Pierce had such a good time that he cried when it was time for family to go home. They certainly make his life so special! Check out my giveaway for BumEase diaper rash spray here! Sounds like it was a wonderful celebration! Your cupcakes were adorable! Happy birthday late to your little one!!!! 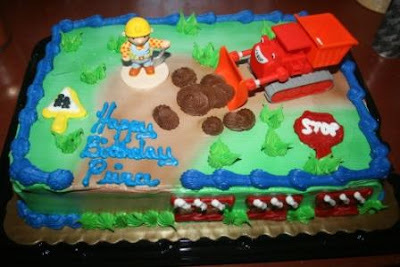 Remind me not to show the bob the builder cake to my little one or I will buying one today!!! OH wow 25 for that?? Yeah I can't say as I blame ya on doing them at home. I would send the picture to cake wrecks though it is a website dedicated to boo boos professional decorators make and attempt to sell to the public. Trust me his name being misspelled is minor when you look at some of the things that happen. The cupcakes with rings look like such fun. It sounds like he had a wonderful day! What a fun day! 5 years old...that makes him officially a Big Boy now! Happy Belated Birthday to Pierce!! The cupcakes are SO cute; thanks for the photo. I have to send some to school on Monday, and love your ideas. Okay I think he is the sweetest child ever - glad he had the best birthday ever too. He is so sweet. Those cupcakes look sooooo good. I love cupcakes! 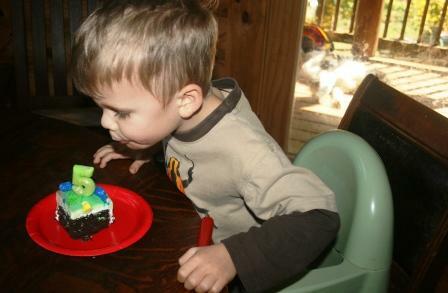 That was really smart to cut the piece first before having him blow out the candle. I may have to steal that idea! I have done cupcakes just like those... but that cake is so cute!!! Bet he loved it. Glad Pierce had a special day. We don't do big parties either and I don't think the kids miss anything in that decision. "A stomach bug has been going around Pierce's class at school, so we decided to let him blow out the candle on his individual piece of cake, just in case we were incubating something." Oh my goodness you just won my heart. I still let her blow out the candles but was musing on how it is the GROSSEST thing ever to do. What a sweet little guy! It looks like he had a very special birthday. Happy Birthday, Pierce! Girly as many B-Day cakes as you have in your future I agree invest in a sheet cake pan and a few basic cake decor tips. You can buy little figurines and use candy etc. for decorating. Basic piping with the icing very easy to do. Easy Peasy you can do it! Sounds like Pierce had a great B-Day! Aw, Happy Birthday Pierce! What fun...cakes, presents, family. I would cry too at the end of this special day! What a magical age to be! Happy Birthday to the big guy! 5 is a fun year!! Many happy returns! Looks like that cake went over well with him. That's so sweet but sad that he cried when everyone had to leave. You sure made it a special day (and week) for him! Happy Birthday to Pierce!!! You gave him a really fun time!! Yes, the special made cakes around here are at least $25.00. The spider cupcakes are really cute, even better looking than in the grocery store! Those 'spider' cupcakes are just deliously 'creapy'! Heeehehhee! I just adore you little Bob the Builder cake...cute. Looks like the little birthday boy had an excellent birthday! God bless ya and have an amazin' day. Sounds like the perfect birthday celebration to me! How sweet that he cried! I know what you mean about the expense of store bought birthday cakes... sheesh, outrageous! I'd be happy with those cool looking cupcakes you made! Pierce sure had a special birthday. That sounds like a perfectly perfect birthday. He is such a cutie! Happy Birthday! I love the cake! I've always made homemade cakes - the boys fav has always been this G.I. Joe tank cake that is so easy to make and so awesome to look at! I love age 5 - I miss my guys being 5. Enjoy this special year:)- and, hopefully, he won't get that awful virus! 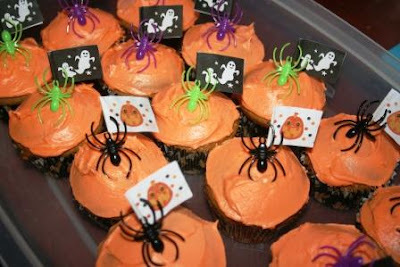 i have looked everywhere for those spider rings for my halloween cupcakes and just can't find them!! I'm glad that Pierce had a wonderful time at his birthday party! Sounds like a great party to me! I have been making my kids cakes myself because cakes are so expensive and just not worth that much. I can do it just as good if not better! lol I have made my daughter those doll cakes which are just so cute. I can't believe they spelled his name wrong! I'm also jealous that your school lets you bring in homemade cupcakes for the class! They just won't allow that here at all. Tomorrow is the Fall Party and everything has to be store bought. It really makes it hard to get the parents to donate items for the parties. Looks like a fabulous party. I love the spider cupcakes. Happy birthday to Pierce! Awwwww. The fact that he cried when it was time for family to leave is a testament to what a wonderful Mother and family he has. That is just the sweetest thing I have ever heard. Sounds like a great day! I love that your school lets you guys bring in homemade cupcakes. Ours will not allow anything homemade. Makes me sad because homemade is SOOO much better! Happy Birthday do your little man! I promise I'm not copying you! lol I posted my son's birthday today and tomorrow the Pumpkin patch pictures. Too funny!